Planning for a 2017 winter wonderland wedding? Great! Just be sure to keep these things in mind so that you and your guests can enjoy every moment. If there’s fresh snow on the ground, take advantage of the unique scenery but make sure you’re prepared with some warm clothing. 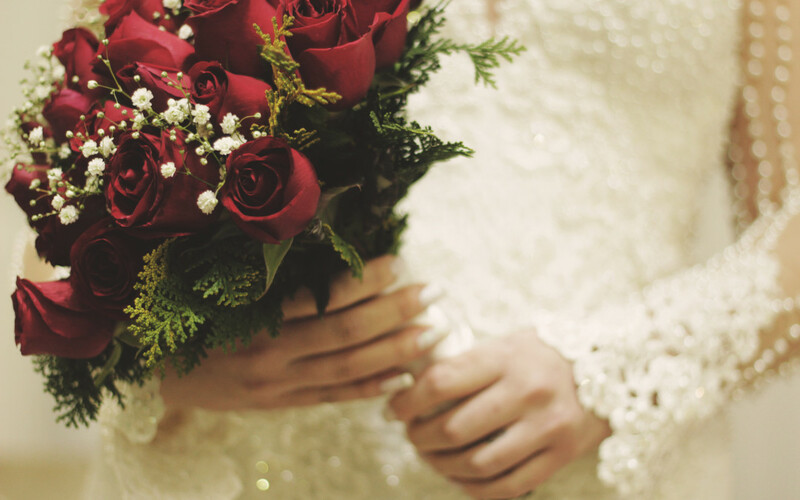 For the bride, plan ahead with a warm shawl or faux fur winter coat to go with your gown. We’ve seen some brides incorporate their “something blue” into their outerwear. When it comes to shoes, consider a pair of white snow boots or UGGS that you can change in and out of for traveling between venues. Don’t forget that the groom could use some spare shoes as well! If you’re wearing a floor-length gown, don’t be afraid to add some extra-warm tights underneath. If it matches with your dress, consider adding a pair of white gloves and ear muffs to stay warm. Again, don’t forget about the groom! Be prepared with a formal black coat to coordinate with his tux. Add a little spice to your photos and have him pick a fun colored scarf that matches your wedding colors. Make sure your bridal party is prepared for the cold as well, especially if you want them in any outdoor pictures. We’ve seen a few brides who gave white down coats as “thank you” gifts, which were both practically and very appreciated. Groomsmen can follow suit with matching scarves and formal coats. Don’t let the weather stop your party. If snow and ice are a possibility, consider having your ceremony and reception at the same venue to minimize travel. Guests will certainly appreciate if your venue is close to their hotel as well. If guests are driving, consider offering complimentary valet parking so they don’t have too far to walk. Consider working out a deal with a car service or Uber for discounted rides. That way, you can make sure your guests get home safely. Make sure you have a designated place for your guests to put their coats, hats and scarves. A coat check is always well received to help avoid any confusion or misplaced coats. If it’s slushy out, opt for a weather mat at the entrance of your venue to avoid slipping and sliding. If you’re hosting a winter wedding outside, be sure to talk to us about an extra tent layer and double-door so we can create an entryway, keeping the cold air out. If you’re hosting a winter wedding outside with us, make sure you order the correct number of heat lamps – we usually recommend one lamp per 10 guests. We’ll help you place them strategically around the room. Above all else, make sure your guests know that at least part of your wedding will be outside so they can be prepared as well. The more you can do to prepare for the weather, the better your event will be. At Benson Tent Rent, we have experience with winter weddings and events so we can certainly help make sure your event goes smooth as ice!